What a cute card...I may have to case this for my upcoming hostess party! Great idea...and cute pix of your wee one as well! Love the quilted look. My mother is a quilter and always love to get quilted looking cards to past on to her friends for birthday and such. Thanks for the idea, will make a couple for her. gorgeous Rita! wishing you a happy New Year!! 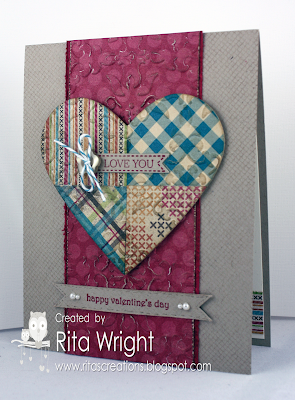 Oh, I love this Rita! You have given me inspiration for a Valentine card for my upcoming workshop. Thank you so much. Rita, love this card! So pretty with the assorted papers and quilting. I love this Valentine! Maybe I'll get to make one.